9 months ago, I came out with what I like to call The Pixar Theory, a narrative that connects every Pixar movie starting with Brave. Of course, there are plenty of other names for this theory (Grand Unification Theory of Pixar is one of the longest), but the point remains the same: these movies appear to tell a story beneath the surface of what we saw in theaters. So as a labor of love, I teamed up with Kayla Savage, an up-and-coming visual development artist, to create The Pixar Detective. You’ve probably noticed that I’ve even changed the tagline of this site to “Pixar Detective,” and that has a lot to do with what we’re creating for you guys. The Pixar Detective is a fan-made series we are both writing and visualizing for any of you who want your Pixar-related questions answered. It tells the story behind the story. What happened to Boo from Monster’s Inc? How did she learn magic? Where do the supers from The Incredibles get their powers? What exactly happened between the events of Up and Wall-e, and where the heck did those cars go? All of these questions and tons more will be answered in a story told through the eyes of new characters we’re introducing to our own fan-made narrative (see artwork above). In fact, we went out of our way to include a lot of the ideas that you all have come up with through your comments and emails. Overall, we’re just doing this to have some fun with movies that we sincerely love. We hope you enjoy it and that it inspires you to go out and create something amazing of your own! 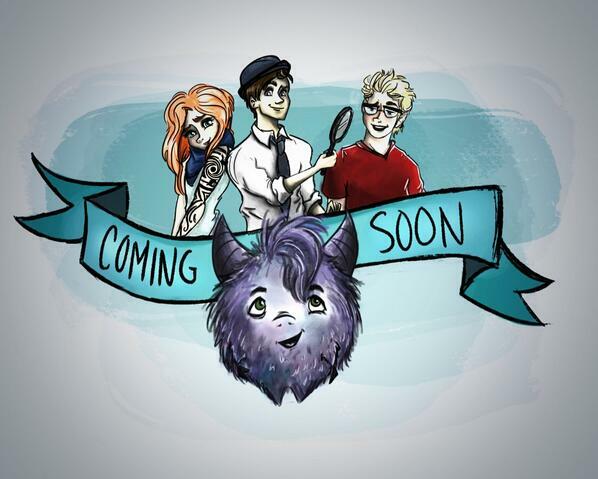 Chapter 1 of The Pixar Detective will be released on April 8th, 2014. New chapters (and artwork!) will be added every two weeks. Next Next post: Blogwarts! ‘Harry Potter’ Spinoff To Be a…Trilogy? You both are SO creative! I am looking forward to reading your creations… and I don’t usually pay attention to fan-made work, so that’s saying something. This looks fascinating. Who’s the third guy in the illustration? You’ll find out in the first chapter. These are all new, original characters with their own story within the Pixar universe. Okay, first off, YAY! Haha, when I first heard of the Pixar theory from a YouTube video I was extremely interested in what the full story was. I found your blog, and was not disappointed in how awesome it was. Ever since then, I’ve been curious as to how it would all work. Sure everything can plausibly be connected, but there’s always more. I found that I wanted a story, or a movie, or a video series, or a comic book- basically anything to see all the elements of the universe in action. So, I am very very excited that you guys are doing this! I wish you good luck on writing, and on the illustrations by your friend, and I’ll be over here (on the other side of the screen where you can’t actually see me) giddily awaiting the first chapter. 🙂 sounds awesome!!! Awesome!! I’ve actually been curious about the “in-between” stuff. Like, the stories between the stories. I’ve always thought of your Pixar Theory kind of like the official Zelda Timeline (whether people agree with it or not). Before Nintendo did the Timeline, they just made the games to stand on their own. Now that they have the Timeline, each game fits in the Timeline somehow (like Skyward Sword being the earliest thus far). So if Pixar were to ever accept your Theory, that’d be so cool if they made their movies like “This is between Cars and Wall-E” or “between Brave and Incredibles”, etc. But I doubt they’d accept it….so it’s awesome that you’re doing it instead! =D I can’t wait!! Exactly! I am far too impatient, after all. Will fans get to contribute to this story too? That would be really cool. – Is Elsa one of the first superhumans? – Would Rapunzel be a superhuman too? – Are the cliched talking animals in Disney movies caused by the same thing that spurred animal intelligence in the Pixar Theory? – Is there a direct connection between Finding Nemo and The Little Mermaid, further linking Tangled and Frozen (Which you said may take place in the same universe as TLM? – Peter Pan could be a superhuman too! I am sure there are more points, good luck on finding them if you pursue this theory! Few things I forgot – there is an obvious struggle for energy (akin to what we see in Cars 2 and Monsters Inc.) in Tangled, and the conscious entities inside the machines in Wreck-It Ralph are fully dependent on humans to even exist (Pixar Theory much?). There is a Disney theory I saw linking Tangled, Frozen and The Little Mermaid. It makes for good reading. What does A113 mean? Are they all connected somehow? Why didn’t the Pizza Planet truck appear in The Incredibles? Did it not exist yet? Where do you think The Incide Out, The Good Dinosaur, Finding Dory, Cars 3, The Incredibles 2, and the Dia de los Muertos film will fit? A113 (sometimes A-113 or A1-13) is an inside joke present as an Easter egg in animated films created by alumni of California Institute of the Arts, referring to the classroom number used by graphic design and character animation students at the school that was used by John Lasseter and Brad Bird among others. The Pizza Planet truck DOES appear, extremely briefly during the scene where the family crashes the truck into the highway. None of the films have come out yet, so how are they supposed to know? 1- Yes, I know. What I was asking is how it could connect to the theory. 3- It’s just suppose to be a wild guess, even with the limited information on the films. Dory will take place one year after the original, so that already has a place.